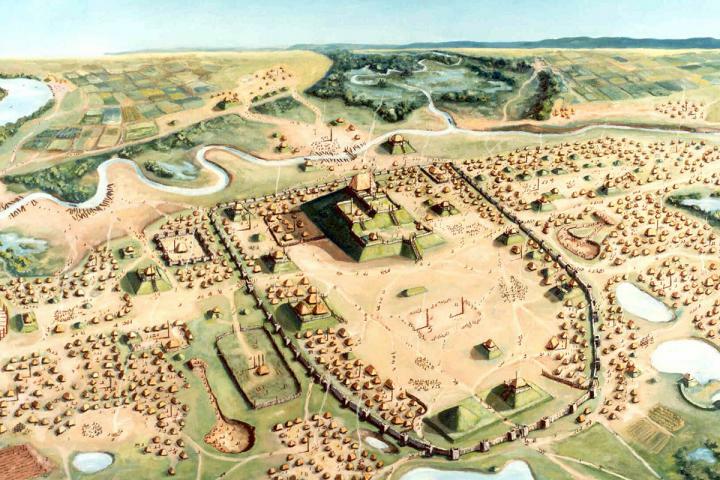 Image courtesy Cahokia Mounds State Historic Site, painting by William R.&nbsp; Iseminger. 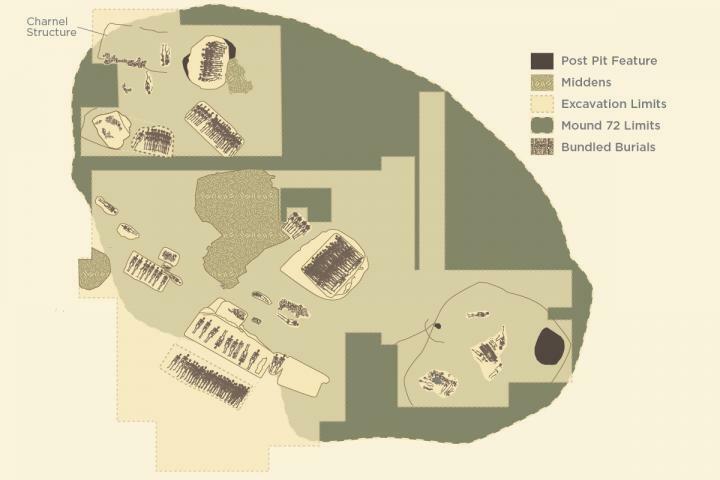 A new study challenges earlier interpretations of an important burial mound at Cahokia, a pre-Columbian city in Illinois near present-day St. Louis. The study reveals that a central feature of the mound, a plot known as the "beaded burial," is not a monument to male power, as was previously thought, but includes both males and females of high status. The new study, published in the journal American Antiquity, is one of several recent analyses of the site from researchers at the Illinois State Archaeological Survey at the University of Illinois and their colleagues at other institutions. All of the studies confirm the presence of males and females in the beaded burial. In 1967, archaeologist Melvin Fowler discovered a massive burial site at Cahokia while excavating an unusual, ridgetop mound. This mound, now called Mound 72, held five mass graves, each containing 20 to more than 50 bodies, with dozens of other bodies buried individually or in groups, sometimes directly over the mass graves. Fowler identified 270 bodies in the mound. Scientists later determined that all of the burials occurred between about 1000 and 1200, during the rise and peak of Cahokia's power and influence. Some of the burials appeared to be high-status individuals whose bodies were placed on cedar litters. "Mound 72 burials are some of the most significant burials ever excavated in North America from this time period," said ISAS director Thomas Emerson, who conducted the most recent study with physical anthropologist Kristin Hedman and skeletal analysts Eve Hargrave of ISAS, Dawn Cobb of the Illinois State Museum Society, and Andrew Thompson of the University of Cincinnati College of Medicine. The ISAS is a division of the Prairie Research Institute at Illinois. "Fowler's and others' interpretation of these mounds became the model that everybody across the east was looking at in terms of understanding status and gender roles and symbolism among Native American groups in this time," Emerson said. Emerson and his colleagues discovered that some of those early interpretations were based on inaccurate and incomplete information. Most of the errors involved the beaded burial. Here, two central bodies were placed, one on top of the other, on a partial bed of beads that also ran between and around the bodies. Several other bodies, buried at the same time, were arranged around this pair. Fowler and later archaeologists came to believe that this was a burial of two high-status males surrounded by their servants. They interpreted the arrangement of beads associated with these central figures as the remains of a beaded cape or blanket in the shape of a bird. The pattern of beads near the heads of the two central bodies resembled a bird head, some thought. Because the bird is a common motif related to warriors and supernatural beings in some Native American traditions, Fowler proposed that the central males of the beaded burial represented mythical warrior chiefs. "One of the things that promoted the concept of the male warrior mythology was the bird image," Emerson said. Once this interpretation took hold, many researchers came to see this as evidence that Cahokia was "a male-dominated hierarchy," he said. 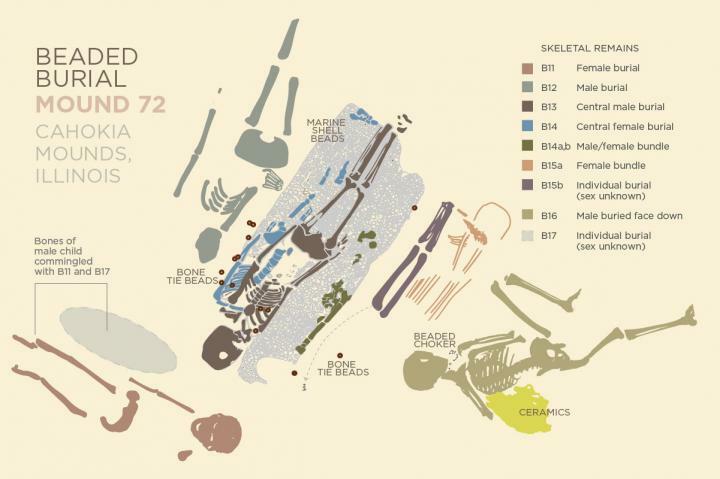 A fresh look at the early archaeologists' maps, notes and reports and the skeletal remains told a new and surprising story. First, the researchers found that there were 12 bodies associated with the beaded burial - not six, as had been previously reported. And independent skeletal analyses conducted by each of the co-authors - Thompson, Hedman, Hargrave and Cobb - revealed that the two central bodies in the beaded burial were actually male and female. "We had been checking to make sure that the individuals we were looking at matched how they had been described," Hedman said. "And in re-examining the beaded burial, we discovered that the central burial included females. This was unexpected." "The fact that these high-status burials included women changes the meaning of the beaded burial feature," Emerson said. "Now, we realize, we don't have a system in which males are these dominant figures and females are playing bit parts. And so, what we have at Cahokia is very much a nobility. It's not a male nobility. It's males and females, and their relationships are very important." The new findings are more in line with other evidence from Cahokia, Emerson said. "For me, having dug temples at Cahokia and analyzed a lot of that material, the symbolism is all about life renewal, fertility, agriculture," he said. "Most of the stone figurines found there are female. The symbols showing up on the pots have to do with water and the underworld. And so now Mound 72 fits into a more consistent story with what we know about the rest of the symbolism and religion at Cahokia." Emerson said that those who saw warrior symbolism at Cahokia missed the special culture of the time period. "When the Spanish and the French came into the southeast as early as the 1500s, they identified these kinds of societies in which both males and females have rank," he said. "Really, the division here is not gender; it's class." "People who saw the warrior symbolism in the beaded burial were actually looking at societies hundreds of years later in the southeast, where warrior symbolism dominated, and projecting it back to Cahokia and saying: 'Well, that's what this must be,'" Emerson said. "And we're saying: 'No, it's not.'" New clue about role of women in "America's 1st city"